Stretching from Mansfield and the foothills of Victoria’s High Country to Tallarook, the Great Victorian Rail Trail incorporates 134 kilometres of rolling pastures, stunning views and majestic gum-lined rivers. Suitable for cyclists, walkers and horse-riders the rail trail is a beautiful journey through the unique communities of north and north-east Victoria. Discover local cafes, historic landmarks, markets and country hospitality as you journey along the rail trail. Gentle gradients along much of the rail trail make it suitable for most fitness levels. You can tackle the entire 134km from either end, or pick a short section of the rail trail starting at one of the many towns or carparks. Departing from the Mansfield Railway Station and Mansfield Visitor Information Centre, the trail passes through the Mullum Wetlands and stunning farming country with a backdrop of magnificent high country vistas. 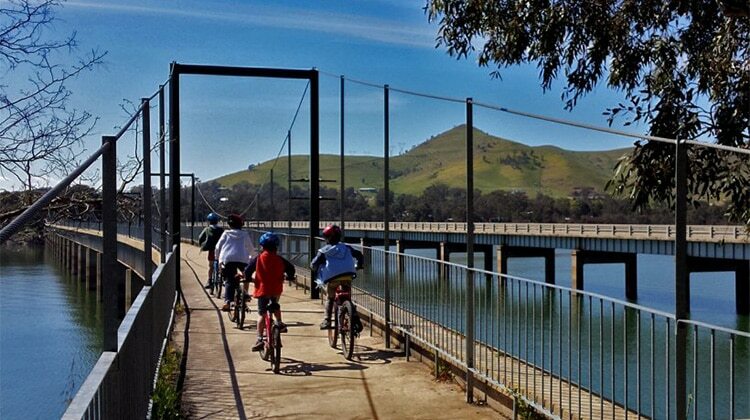 The trail passes over the 385 metre long Bonnie Doon Rail Bridge, providing a great vantage spot to stop and take in the sights of the lake, before arriving at Bonnie Doon. Visit the Great Victorian Rail Trail website for more information.